The 10" tub saw features a variable height cutting head and large sliding guide tray that allow the operator to cut a tile up to 20" in length (14" on diagonal) and a depth of 3" on plunge cuts. The included pump and water distribution system keeps the blade cooled while cutting down on dust. The machine can be fitted with a continuous rim blade for tile and marble work, or with a segmented blade for masonry and block. Optional stand is available. Machine weighs approximately 90 lbs. 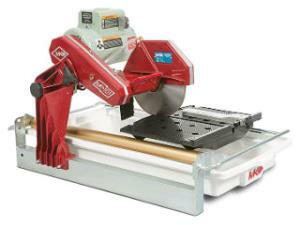 * Please call us for any questions on our tub saw 10 inch rentals in Hillsdale and Ridgewood NJ.